I just finished writing an article called "Extreme Limited Palettes" for International Artist magazine and I want to preview one small part of it for you. The article will include these four color charts. Each diamond-shaped diagram represents the possibilities of three colors, plus white. Each diamond shape is composed of two isosceles triangles. The left triangle represents the gouache colors straight out of the tube, and the right one represents the mirror image of those colors, but mixed with white. Secondary mixtures appear as rectangles along the side of each triangle. The darkest "black" you can get from those colors is the small dark patch in the center of the left triangle. Each chart gives a sense of the full available gamut for that limited palette, so you can see at a glance what's possible with a given set of colors. For example, you can see how this painting belongs with the chart in the upper right, the one with yellow ochre (Holbein), perylene maroon (Winsor Newton), and viridian lake (Winsor Newton)—plus white (M. Graham). Below is another way to set up the charts using hexagons to represent the color wheel, with tints in the center. These are done with oil. The colors you choose for your limited palette don’t have to be blue, red, and yellow, or even cyan, magenta, and yellow. As long as they’re differentiated, the painting will seem to have a full universe of colors. Before you start a given painting, you can refer to a set of charts like these to decide which limited palette would suit the subject you want to paint. These charts would be a big help if you're thinking of joining in with the Graveyard Painting Challenge for October. Awesome! I need to do this. And I'm going to try and participate in the graveyard challenge. Let us know when the magazine is out and I will pick up a copy. Thank you for sharing this valuable information. This will definitely help me prepare and experiment using different limited palettes for the October challenge. I always learn something new and helpful from your blogs. This post convinced me I needed to buy your Color and Light book. It arrived today and every page is a joy. Thank you! James, is this kind of information included in 'Color and Light'? As a novice painter, your instructional videos are helping me a lot, but I feel that I need to get a good foundation in color. 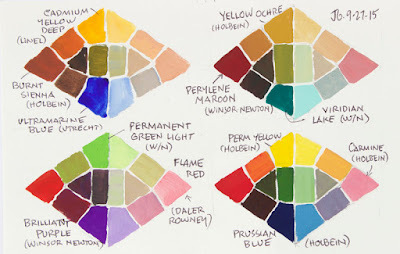 Also, do you use this kind of scheme for watercolors? Thanks. 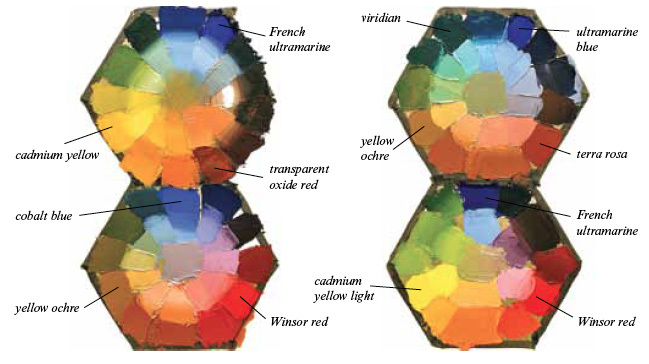 Carlos, yes, the second diagram is from Color and Light, which has a section on limited palettes, and a lot more. With pan watercolors, it's a little harder to maintain the discipline of limited pigments unless you cover over the ones you don't want to use with tape or something. I treasure this post a lot as I'm learning watercolors. I love color mixing, and I love working with as few colors as possible and mixing the rest. Five colors is kind of exorbitant for me. That said, I have built upon the diamonds here to make "extended diamonds" because pigments can be weird in different proportions. Ah anyways here is my post. It's so simple I'm not sure it merits a post—basically just break up the corner triangles into a triangle plus two trapezoids, so you get three "color mix" areas per triangle side. Great post, Ava. That's such a good exercise.